The System For Systemising Your Business. While every business is different in their make up and stage of growth – the process is the same. When you work with a certified SYSTEMologist you can feel confident they are working from our proven, proprietary 7 step process. The process begins by identifying your Critical Client Flow (CCF). Only by identifying and focusing on the critical steps in your lead generation, conversion and delivery, will you be able to get the quickest traction. Often times the business owner is the worst person to document systems and processes because they can always ‘do it better themselves’. But that attitude doesn’t get you far, so our next step is to identify the core departments within your business. Department Heads are now identified and the responsibly of recording how the business is currently run gets delegated. At the end of this step, it will be clear what systems need to be created and who will be responsible for them. In this step, our SYSTEMologist works with your team to capture how the team is currently completing and delivering your product/service. This is often done through online live recording and/or video recordings. The SYSTEMologist then extracts that valuable information and places it in the supporting documentation. Smart Operating Procedures (SOPs) may include the original video recording, a written process, checklist, flow chart and other supporting material such as scripts, forms, email templates, and so on. Having great systems is one thing, but keeping them formatted and organised consistently – and easy to find – is another. To solve this problem we have developed our own cloud based software solution called systemHUB.com. Your SYSTEMologist is expertly trained in this software and will setup, customise and provide your team with training on how the platform works. Because your systems will be in this easy to use, secure, cloud based platform, systemHUB will quickly become the heart of all your systems. Your SYSTEMologist will add incredible value in this step because, unless your team follow your system, they will never reach their full potential. SYSTEMologists have numerous strategies at their dispolsal to increase team member “buy in” and continued systems engagement. In this step, our SYSTEMologist will identify the systems critical for scaling your business – including financial systems, human resource systems and management systems. There will be a specific focus on getting your recruitment, on boarding and training processes right, as these are critical to growth and fostering the systems thinking mindset. The final step in the process, once your most important systems and processes are organised and integrated, it’s time to look for obvious improvements to increase efficiency. Using a variety of methods, your SYSTEMologist will work with your team to identify quick and easy opportunities for optimisation. People often begin the process of optimisation too early, looking to make each step in their processes “perfect” before implementation. A better approach is to first capture what you are already doing and then from there, improve upon it. 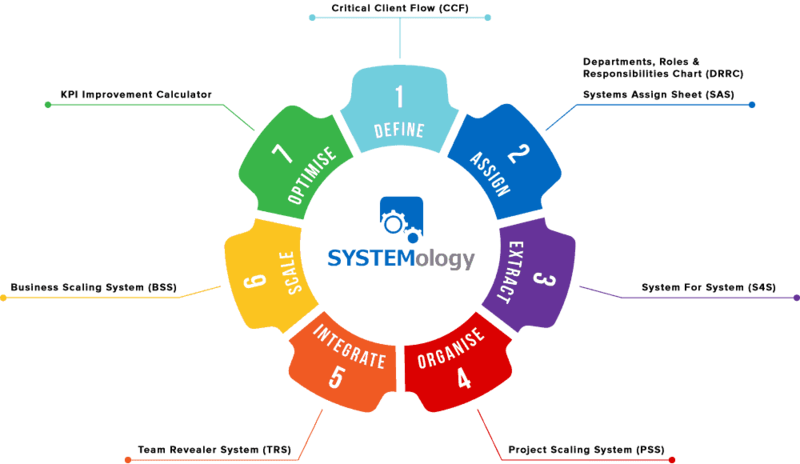 Ready To Get SYSTEMology® Working In Your Business?